Hello folks and Happy Halloween! Even if you are not planning to go trick or treating outside, you can always do some guessing, while sitting in the comfort of your abode. On this event, we have a small quiz for all our readers to keep things entertaining. Post your guesses on who’s who in terms of anime characters the Meta team members selected for the above art, drawn by Fosh. You can click the image to see the larger version for details. And like any other special post, our Team has some special messages ahead! Happy Halloween! If you don’t celebrate Halloween, then uhh… Happy day! Anyway, I would just like to take this moment to thank all of our readers for your continued patronage. It’s always amazing to think that there are people out there willing to spend their time reading, listening to, and more recently watching our ramblings on anime and manga. Now, I know we don’t do manga posts too regularly (my own attempt to spearhead a movement over Summer fell through once school started), but we might just have a some posts up our sleeves to remedy the situation in the short term. *wink* As for anime though, we’ve got you covered, with perhaps even a few more shows joining our regular coverage once we sort out the logistics. So stay tuned to Metanorn for more thoughts and discussion on the Fall season! Happy Halloween! I hope you’re enjoying all the Christmas decorations at your local Target or whatever arts & crafts store that knows Christmas is where the money’s at. Holidays… more like commercials, amirite? All that nonsense aside, I remember dressing up as Link and a Ninja Turtle many years ago, those were my most favorite costumes. Enjoy some treats and drinks and have a better than fun-sized halloween! Dear Ernest Readers: Wishing you a safe and happy All Hallow’s Eve. I hope your witches are cute, and your goblins as well. Your ghosts may have feet, or may not. But that creepy thing that lives under your stairs has to go. You didn’t know about the creepy thing? Oh, Well. I still wish you the best…. It’s finally that time of year again~. Happy Halloween to all of you readers out there! I don’t know about you guys, but since I’m not really doing anything costume-wise, I’m just going to use the holiday as an excuse to buy large amounts of candy without fear of judgemental stares. As per every year. Though, uh, hopefully everyone remembers to brush their teeth afterwards. Root canals are terrible, terrible things. 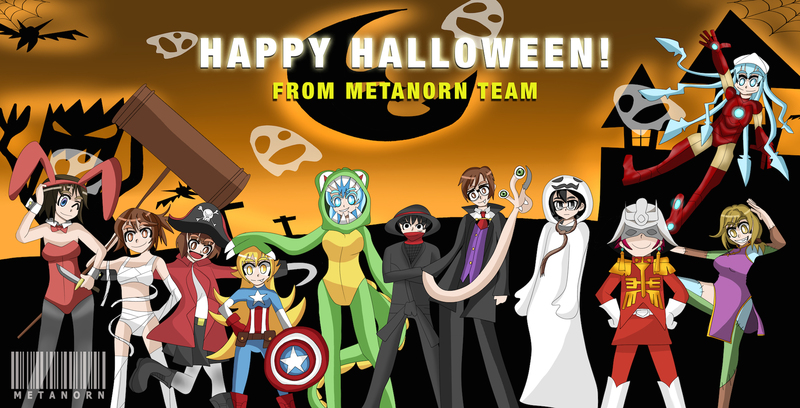 OTL For the moment though, I hope everyone enjoys Metanorn’s Halloween posts, and thanks as always for reading~! I was surprised when Suma told me that Halloween is at the end of October. I always thought that it’s in October 11, teheh. Yeah, very few people (excluding me) celebrate this occasion in my place, so I didn’t expect such grandiose celebration everywhere including Meta. That’s why I’ll never remember the date for Halloween. I guess this is a first memorable Halloween celebration, for me? And since this here in Metanorn is probably the only time where I can celebrate it, I’m going to say Happy Halloween and dress up as crazy as possible because that’s the only time where people won’t complain about you cosplaying in a non-con occasion! Happy Halloween everyone! While it’s not my favorite holiday (actually, it’s probably my least favorite, you guys know how much I dislike scary stuff), I hope everyone has fun and stays out of trouble. Enjoy the day, and if you MUST summon demons from other dimensions, make sure you know how to keep them under control! Happy Halloween everyone! Hopefully you’re all gearing up for some serious Halloween fun with awesome costumes and parties and the like, or planning for a simple scary movie marathon (with a ton of candy of course) like I am. And if you don’t celebrate Halloween, hopefully you have a fun, stress-free night in general! It’s Friday; we all gotta celebrate the end of the week somehow, holiday or not. Anyway, aside from the hopeful Halloween fun wishes, thanks you as always dear readers for joining us here at Metanorn, commenting and checking out our always awesome posts and podcasts~ It’s truly amazing how we can all come together like this in our strange love for anime and manga and rave, criticize, rant about our favorite, and non-favorite, shows. Hopefully we can continue on with this fun for as long as we can~! Happy Halloween, everyone! I’m about half my life removed from trick or treating age, but I wonder if any of our readers are young enough to still go trick or treating. If you are, have fun out there! And remember, all those urban myths about Halloween really are myths; stay safe, but rest easy knowing that tonight is about as safe for you as any other night of the year. Maybe that’s counterproductive to getting into the horror mood, but hey, them’s the breaks. Happy Halloween readers! Id’ like to first thank Fosh, who painstakingly drew the whole team. It’s not easy to do so but his work paid off and we virtually cosplayed some very interesting costumes. Mine comes from Haruhi of course and and do notice that knife and such… Teehee! I also wanted to take this opportunity to thank Metanorn Team, who are awesome and same to our regulars, who make aniblogging worthwhile! We wouldn’t be inching towards 7th year if it wasn’t for the community of our regulars and lurkers. S0, thank you for sticking around and keep having fun with us as there are some scary posts coming through! Vampires are #1! 500 year and 495 year old little girls that look underaged are completely legal! This week on Fate/Naked Illya! Alucard and Seras Victoria for the win!! My favorite vampire sparkles in a completely different way! You should love the vampire from Let the Right One In. Or the one from the Let Me In remake. Now those were real vampires for all their looking like 12 year-old girls. I read the translation of the book, and it’s far better as they treated the main vampire as androgynous. In both films it was female, but the original kept it a bit more honest. I thought the remake was unnecessary. I’ve seen both of them because I have them on DVD. They were both great movies showcasing a sweet and endearing human x vampire relationship. Even if the American version Let Me In harbors some differences from the original Let The Right One In, as whole, it was well done. I’ve also seen both movies and prefer the original, which I have on DVD, though the remake is good. Never read the book. The only one I found closest to the real thing in that franchise was Dakota Fanning’s character Jane. She was creepy as hell. Which one would you go with more? Interview with the Vampire: The Vampire Chronicles or Queen of the Damned? Still better than the ones by the author with the *brrr* crappy sparkly vampires. I find faults in both writers. One is immature in her wish fulfillment, the other is superfluous. Both had interesting ideas, but the writing turned me off for both authors. No, I haven’t but it sounds like something right up my alley. The idea of a ruling vampire society? I’d definitely support that. And Shiki was so close to achieving it. Damn Toshio Ozaki, Natsuno Yuuki and the rest of the Sotoba villagers! In this one, Inspertor Lestrade is still and Inspector, in addition to being a vampire. But for reasons, he is basically the Sherlock of the story. My strike zone is between 4 and 5…hundreds, that is. Any more than that, and they’re just old droopy hags. Happy Halloween to everybody!!! My family and I don’t celebrate Halloween but I personally always get a thrill with the time period that allows the showing of supernatural creatures going about doing their thing. Going bump in the night. I do still buy and watch whatever related shows that pique my interest. Now I’m curious. Who likes what monster? So I’m to expect a number of Halloween related posts in one day? I say to that: Yes!! Bring it on!! What about your guesses on which writer is depicted in Fosh’s picture. Me as Shiki is easy, but can our faithful readers/lurkers, guess about others? Well, you’ve already revealed yourself. skylion is obviously Shinobu dressed as Captain America, Jrow is the pirate, Fosh is Squid Girl in the Iron Man armor. I don’t have a clue about the others yet. I spent the night out on the front steps passing out candy to the neighborhood hob-goblins. I hope you had fun, too!